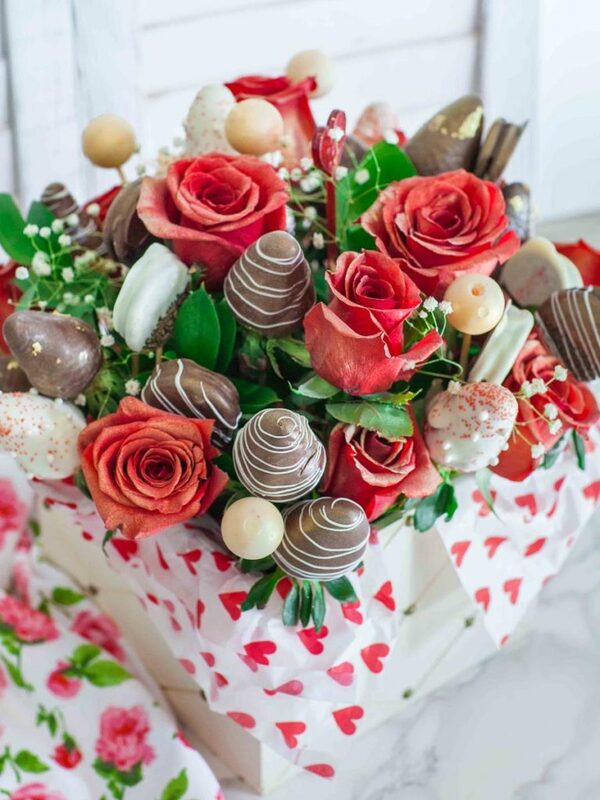 How stunning is this beautiful arrangement of roses, strawberries and cookies for Valentine’s Day?! If you’ve ever been ashamed of giving a boring gift to your loved one on this special holiday, it’s time to up the game with this edible arrangement! 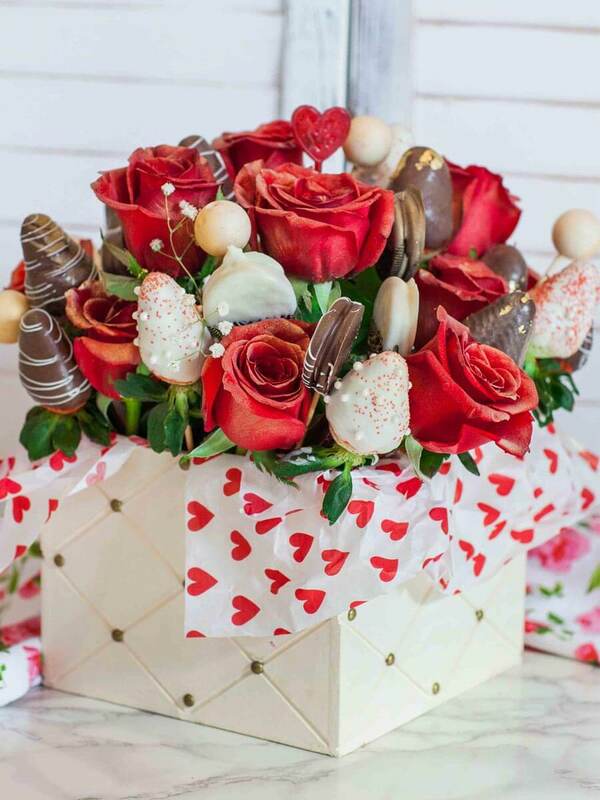 I’m going to show you step-by-step how to make this pretty arrangement with roses, chocolate covered strawberries, chocolate-covered Oreos and chocolate truffles. Plus, I add a bit of gold dust and edible gold leaf to make it extra special! It’s the perfect Valentine’s Day gift! Watch my video tutorial for my step-by-step instructions! Want to get notifications for my new recipes? Just subscribe to my YouTube channel and you’ll receive and email notification every time a new video goes live! Box & Tissue Paper – you’ll need a beautiful box, bucket, or container to hold the arrangement in. I used a 10×10-inch box for my arrangement and lined with some Valentine’s Day tissue paper, then filled it with cardboard strips. A block of foam will also work well; a wet floral foam block will work well, too. This round, hat-box style box would be perfect! Roses/Flowers – I went with classic red roses but any color will work. You can even coordinate the color of the roses or flowers with the chocolate melts – purple roses with purple chocolate covered strawberries. If you want to make the arrangement a few days ahead of time, make sure to use a wet floral block; this way the roses will stay fresh not wilt. Plus, don’t forget to get some greens for filling in the empty spots. Strawberries – I always wash my strawberries and let them dry completely on a kitchen towel. Go for large and firm strawberries that will hold up well when coated. Cookies/Macarons – I didn’t have any macarons on hand for this video recipe, but a quick run to Trader Joe’s will work, too! I used Oreo sandwich cookies, but macarons and other cookies will work great, too. Chocolate truffles – I love the new Strawberries & Cream Lindt truffles and they worked so well for this arrangement. Chocolate – I recommend going with Ghirardelli chocolate melts. These do not need to be tempered and will set at room temperature. All the gold – I used this edible gold spray paint by Wilton for the roses, cookies and truffles. And a bit of edible gold leaf always makes any dessert extra special! To hold the strawberries and cookies in place, I used thin bamboo skewers. And this handy craft foam board is a must for making strawberries – it’s the best way to get perfect chocolate covered strawberries. Enjoyed this tutorial? Please share and save it to Pinterest! Check out these other amazing dessert recipe ideas for Valentine’s Day! Prepare the box that will hold the arrangement first. 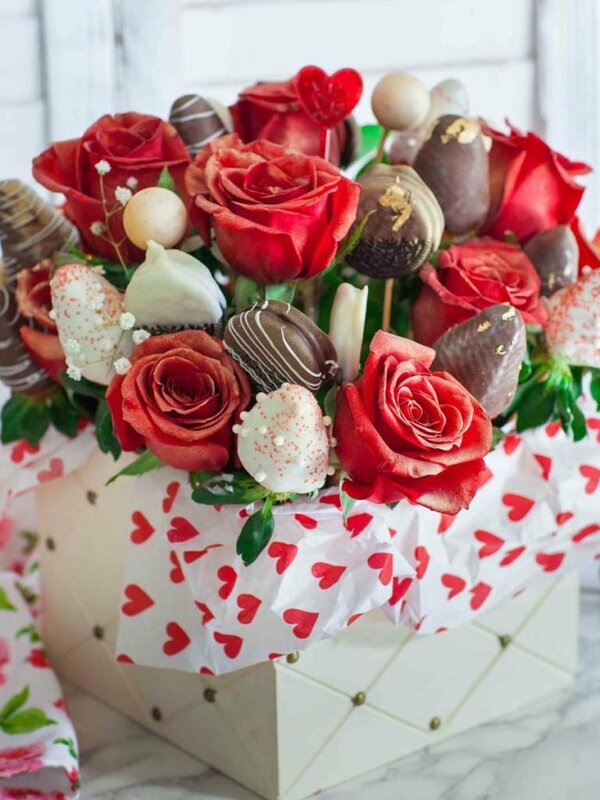 Line the inside with decorative tissue paper, then add a foam block or paper shreds to hold the roses and chocolates in place. Cut half the bamboo skewers to a shorter length, about 2 inches shorter; these will be for the sides of the bouquet. Use the bamboo skewers as guides for cutting the roses down to size. Arrange the roses in the prepared box; if desired, use a wet foam block to keep the roses fresh for longer. Place the chocolate melts into separate mixing bowls. Heat over a double boiler or in the microwave until the chocolate is completely melted, about 2 minutes; stir every 30 seconds. Meanwhile, prepare the strawberries and cookies for dipping - place them onto the bamboo skewers. Dip the strawberries and cookies into the melted chocolate. For the strawberries, dip them into the chocolate, tap off any excess, then prop onto a foam board to allow the chocolate to set. The same can be done for the cookies, or they can be laid flat to dry on a silicone mat or parchment paper. Garnish the strawberries, cookies and truffles with sprinkles or drizzle with opposite color chocolate. Spray the roses with gold spray and add edible gold leaf to the strawberries and cookies. Once the chocolate is set, put the arrangement together. Alternate adding strawberries, cookies and truffles. Work your way around the arrangement starting from the center and adding the different items in a sporadic pattern. Chocolate covered strawberries are good within the first 24 hours. I recommend making this arrangement and gifting it right away or the next day. If you are making it the night before, place the bouquet into the refrigerator so the strawberries and roses stay fresh.